Note: Health courses do not satisfy the physical education requirement, but are considered a valuable source of knowledge to maintain a lifestyle of wellness. This required course is a part of a comprehensive health curriculum which has been offered throughout the student’s educational process. Major areas of emphasis will be mental health; physical fitness and safety; substance use and abuse; nutrition; contagious diseases; and human growth and development. This course emphasizes participation in activities that develop, maintain and improve cardiovascular fitness, body composition, flexibility, muscular strength and endurance. The student will learn basic lifetime fitness concepts and principles in a light to moderate activity level. This course is ideal to satisfy the P.E. requirement for graduation in a primarily fitness-based, non-competitive environment. This course emphasizes physical fitness and team sport activities. Students will learn the history, strategy, and rules of various team sports as well as develop and improve their physical skills and techniques. Sports include: soccer, football, basketball, and volleyball. This is an entry-level course designed to provide an emphasis on strength training and conditioning safety, etiquette and technique. The student will also learn basic strength and conditioning concepts and principles. 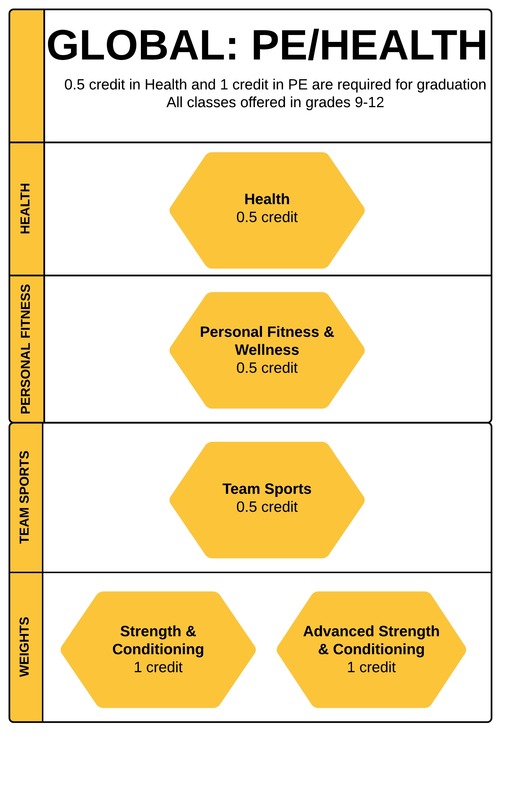 The course will also make the connection between training and performance. Course activities focus on improving athletic performance by developing, maintaining, and improving strength, endurance, flexibility, speed, power, and agility. This course is designed to provide students with the opportunity to stay involved in strength training and conditioning activities. This course builds on previously learned physical training concepts with more advanced information on exercise physiology and biomechanics. Students will also engage in more rigorous and strenuous physical activity designed to improve athletic performance by developing, maintaining, and improving strength, endurance, flexibility, speed, power, and agility.